Replacement brooms for most popular street sweepers. Our goal is to offer a long-lasting, more effective broom at an extremely competitive price point. 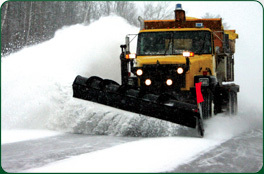 Replacement plow blades for most popular snow plows. Atlantic maintains one of the largest inventory of replacement plow cutting edges in North America. 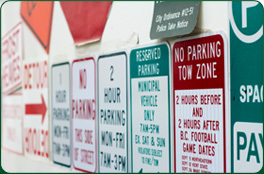 Signs and safety products for property managers, contractors and municipalities. Partner with Atlantic Highway Sign to direct drivers and pedestrians with safety and efficiency. Atlantic Broom Service has become a one-stop shop for all of the roadway safety products that your property demands. 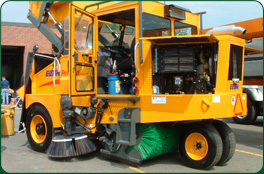 Choose from replacement street sweeper brooms, blades and supplies for snow plows or traffic and highway signage for towns, cities, contracting companies, property management firms and more. Contact us today to learn more about our complete solution for roadway safety. Our one-stop shop can help you avoid harmful accidents and costly lawsuits that can come from poorly maintained roads and signage. Atlantic Broom Service has recently moved to a new location!